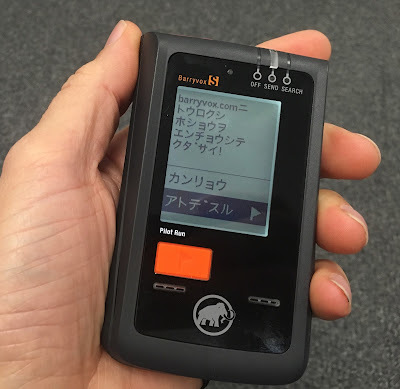 Mammut Avalanche Safety: Tech tips: I accidentally changed the language of my Barryvox S--how do I switch it back? Tech tips: I accidentally changed the language of my Barryvox S--how do I switch it back? Every once in a while we get a call from someone who accidentally switched the language of their transceiver or is borrowing one from someone who speaks a different language. Both the Pulse and now the Barryvox S support a number of languages. If your transceiver is set to a language you don't speak, don't panic--it's simple to change it. are below, but it's helpful to read through the instructions ahead of time and know what to expect, since one of the procedures only allows 5 seconds for you to select an option. If you know what to expect this is plenty of time, but if you are busy reading the instructions for the first time you'll miss it. The Barryvox S will prompt the user on startup to verify that they have registered for the additional 3 years of warranty. If you select "later", this message will come up every time you start the beacon, in which case you'll need to click past that screen to get to the "BarryvoxS/Mammut logo" startup screen. If you previously clicked "DONE" to verify warranty registration, then it will go directly to the "Barryvox S" startup image. So first, remember that once the dynamic "BarryvoxS/Mammut logo" startup screen comes up, you have only 5 seconds to scroll and select an option before the beacon goes into send. The instructions below refer to the SCROLL-BAR (the up/down buttons on the Right side) and the ORANGE FLAG button on the front. 1) Turn the beacon off. You can only access the user settings during startup. If you have not clicked to verify warranty registration on the beacon, the Startup screen will not come up immediately. In this case you need to push the ORANGE FLAG button to get to the "BarryvoxS/Mammut logo" startup image. You now have 5 seconds both to use the SCROLL BAR to click down to the "cog wheel" icon on the right margin, and push the ORANGE FLAG button to select this option. You can now relax and take your time. 3) "language" is the first setting, so simply push the ORANGE FLAG button to access the list of languages. 4) Use the SCROLL BAR to select the language you prefer. You may have to scroll up or down if you don't see it. 5) Push the ORANGE FLAG button to select the language. You are now in SEND mode with a beacon that speaks your preferred language.